In a late chapter of My Breath in Art, her book of philosophical and practical reflections based on five decades of acting and teaching, Beatrice Manley notes how perspectives have changed in the formation of actors: the feeling for language tends to be disregarded now in favor of a greater concern with naturalism, with making a quick impression. Oral reading in particular, a fundamental technique when she was a student, has gone out of fashion in an era when actors are looking far more often toward television and film. For a reading, she says, “a performer has to know where the steel beams of a story are and to allow for the twists and turns of a character's thoughts and still keep the narrative line clear.” What this demands, of course, is to pay special attention to the punctuation of a text, as she herself was reminded when rehearsing the role of Winnie in Beckett's Happy Days: by trusting the sentence she was able to arrive at the emotions that Beckett intended. In effect, as much as a guide to acting, this is also a book about reading. Manley has had a unique itinerary since her debut on Broadway at the age of twenty. In the 1960s, as a founding member of the San Francisco Actor's Workshop, she helped present the first West Coast productions of writers like Beckett and Genet; she was also the first actress in America to play the role of Brecht’s Mother Courage. Moving to Los Angeles in the early 1970s where she still lives, she taught at Cal Arts and later privately, and continued to perform, mostly on stage. 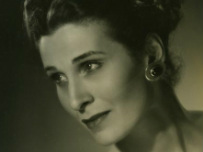 Besides appearing in Beckett, including his late play Rockaby, and Andrei Serban's New York production of Uncle Vanya in the mid-1980s, among other works, she has adapted a number of literary texts for solo performances: Poe’s story of a severed head (“A Predicament”), Yeats’s Crazy Jane poems, Cortázar’s tales of Cronopios and Famas, Joyce’s Molly Bloom soliloquy, and an interview with Céleste Albaret, Proust’s housekeeper. As a writer, her librettos and plays have premiered at the California New Music Festival and La Mama in New York. Performing a text, according to Manley, is like following a musical score by way of the breath. The idea is to sculpt the breath “into a fountain of air as it flows and crests under the hard palate” on meeting the words. The actor must learn to inhabit the text, to “breathe the character into the body.” She emphasizes the physicality of words, the energy and texture of each letter, how the vibrations stirred up by the placement of vowels and consonants on the tongue produce meaning and emotion; by locating where in the mouth different sounds are formed, an actor may use such awareness even to trigger laughter or crying. But to allow the imagination its full scope, to attain an effortless speech and subtleties of interpretation, one must clear the body of emotional debris and tension. Inescapably, this leads to the question of technique, “angelic guide to Spontaneity,” which has to be learned and assimilated so that it seeps way down and becomes cellular intelligence. Only by the confidence gained through technique can one hold off the fears. Orchestrated in brief takes, through a process of repeating and extending its lessons, the book teaches without intimidating. Patiently Manley builds upon the actor’s intuition, so that what is taken for granted---the breath, the body, words, learning itself---may be seen in light of wider implications. By the unassuming range of her examples, she forestalls the reader from making facile judgments: acting is her sole preoccupation, not the arena. Thus, to illustrate her points, she draws on popular movies, performances by Hollywood stars, actors’ and athletes’ memoirs (the wry wisdom of George Burns opens and closes the book), references to figures in television, theater, and music, case studies from her own teaching practice, ideas gleaned from Alexander Technique and Tai Chi, and not least, problems she herself has confronted as an actress. An abiding concern throughout, technique as a subject treated directly ends up among her shortest chapters, followed by one of like brevity on “doing nothing,” that receptive state in which the actor “lets the intangible happen.” Only then does she launch into “The Acting Chapter,” the longest by far, whose main part (“28 little essays about acting”) focuses on the many nuances of the practice: questions of identity, inner structure, timing, trying too hard, the use of mental images, language as grounding, props, what to do with the hands. Ultimately, beyond schools or specific styles, Manley seeks to help the actor attain that balance by which one may find what is truthful in a performance. Along the way, one learns to trust both the author and one’s own imagination flowing deeply within. Beatrice Manley died in Milwaukee, Wisconsin on September 14, 2002. This brief memorial piece was written the following month for a tribute in her honor held in Los Angeles. When I think back on how many times I saw Beatrice over the last twenty-plus years, it was not often. We lived about nine thousands miles apart, then later only three thousand, and most recently a mere fifteen hundred or so. It was a unique pleasure now and then to receive her letters, she would write about work, personal reflections, quotidian details, in one quick and graceful sweep; her e-mails in the last years were briefer still, they seemed almost too short, but when I read through them again I had to ask myself, what else was there to say? Part Jewish sage, part sprightly grandmother or precocious girl, she also seemed to carry a little part within her of all the solo characters I had seen her play: Céleste, Molly Bloom, Crazy Jane. Both of us, in nearly so many words, occasionally used to sigh, Ah, if she were only forty years younger. Instead of her being a sort of surrogate mother for me, which I neither sought nor needed, ours was like an innocent, affectionate flirtation. I first met Beatrice in 1978, when I moved to L.A. for what turned out to be only a year to study screenwriting. My poetry teacher at Berkeley, Josephine Miles, had given me her number. I was twenty-two years old and fresh from a first trip to Europe, so that the whole year long I kept wondering what I was doing there in L.A.---was that the right place for me as a writer, and how could I get back to Europe? I used to go visit Beatrice sometimes, and she would introduce me to her younger as well as older friends. She was always very generous in that way. She seemed infinitely patient and kind, and always willing to share her time and interest, to let such a young fellow as I was into her world, which was a world full of curiosity, of attention to small wonders. Perhaps I had really gone to L.A. to study with Beatrice, unbeknownst to me. After, I went off to Paris for a decade, and then later New York, so that I only managed to visit her every few years and in the ‘90s maybe only twice. While in Paris, I tried to push for her when I could. When a friend started up a literary journal, I impressed upon her how she shouldn’t miss the chance to publish an excerpt from one of Beatrice’s plays. I was less successful with the American Center: at a Beckett colloquium, I introduced myself to Ruby Cohn and led her over to the center’s director to sing Beatrice’s praises, that they should get on the ball and invite Beatrice to perform in Paris. It almost worked, or so I thought, but the real wonders of the world usually remain unheralded in their own time, left only to the lucky few of us to bear witness.